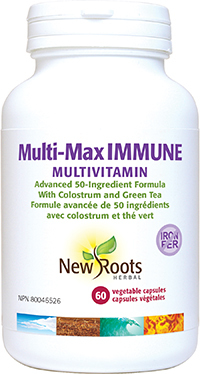 Multi-Max Immune provides vitamins, minerals, cofactors, amino acids, antioxidants, and immune-boosting nutraceuticals. The most comprehensive multivitamin/nutraceutical available. In this fast-paced world of processed foods, it’s hard to get the nutrients we need to stay healthy. Often times, we grab a multivitamin and think we are getting all the benefits vitamins and minerals offer. Pollution and stress levels have reached epidemic proportions, and diet alone can’t make up for the extra load on the body. To maintain and reach optimal health, we need more antioxidants—like vitamin C, E, and A, carotenes, and selenium to help fight pollution and disease; more B vitamins to help the body better cope with stress, chemicals, and denatured food; and minerals to help the body, especially the bones, stay strong. We’ve formulated Multi‑Max Immune to supply not just the benefits of vitamins and minerals, but also of a broad range of amino acids and a host of nutraceuticals such as heart-healthy coenzyme Q10, superantioxidant green tea, eye- and prostate-healthy lycopene, digestive enzymes to help digest our denatured foods, chlorophyll-rich Peacegreens, special enzyme form of vitamins, and more. Multi‑Max Immune can help correct any vitamin deficiency that may result from the poor diet that has become all too common in North America. Improving levels of important vitamins can mean a healthier, longer, more productive life. Adults: Take 2 capsules two to four times daily with meals or as directed by your health-care practitioner. If you are taking other medications, take this product a few hours before or after them. Consult a health-care practitioner for use beyond 4 weeks. Other ingredients: Vegetable magnesium stearate, silicon dioxide, arabinogalactan (25 mg per 2 capsules), and microcrystalline cellulose in a non‑GMO vegetable capsule composed of vegetable carbohydrate gum and purified water.